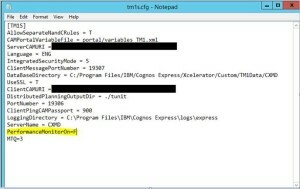 Cognos Express 10.2.1 – A Solution to the TM1 Server crashing after running the SaveDataAll process as a chore. The TM1 server crashes after the SaveDataAll process is scheduled to run as a chore. This can results in loss of data/changes made since the last successful SaveDataAll process was run, and will require the express services to be restarted or in some cases, the server to be restarted. Disable the Performance Monitor feature by setting it to false; PerformanceMonitorOn=F. Backup the file first to ensure you can revert any changes. Restart the services in reverse order. IBM are aware of this issue and will be providing a resolution for it within Fix Pack 2 which will be available later this year.